Uri Geller moving sticky magnets from his forehead to thumb while everyone is distracted in order to "psychically" move a compass during the second part of his set. 4. Testimonials on Geller's "abilities"
Coast to Coast AM: March 25, 2004; November 8, 2004; June 7, 2007; September 12, 2007; October 24, 2007; October 20, 2013 (full four hours); January 30, 2017. Uri Geller is the world's most famous alleged psychic and psychokinetic. Best known as the originator of the paranormal spoon-bending practice. Coast to Coast AM biography: "Uri Geller is the world's most investigated and celebrated paranormalist. He is famous around the globe for his mind bending psychic powers and has led a very unique life shrouded in debate, controversy and mystery. Uri has been studied by scientists who worked with Albert Einstein, worked with the FBI and CIA, has been a pupil of Salvador Dali, and he is also related to Sigmund Freud." Even if a portion of Geller's alleged psi abilities are real, he has done an excellent job of masking that by seemingly only demonstrating his abilities on stage and introducing illusionary tactics. A perfect example of this is Geller's age-old (dating back to SRI) trick of using "mental energy" of himself and that of his crowd to turn compas needles. Recent footage from a show he did in Israel clearly shows Geller sticking little magnets to his thumbs while the crowd is not looking. See image sequence at the top of this article. Also, more information is to follow. Dr. Edgar D. Mitchell (of C2C AM): "I was in Scientific laboratories at Stanford Research Institute investigating a rather amazing individual Uri Geller. Uri's ability to perform amazing feats of mental wizardry is known the world over. We in Science are just now catching up and understanding what you can do with exercise and proper practise. Uri is Not a magician. He is using capabilities that we all have and can develop with exercise and practice. After the Geller work, I was asked to brief the director of the CIA, Ambassador George Bush (Later to become President of the United States), on our activities and the results." Prof. David Bohm (of Holographic Universe fame) and Prof. John Hasted: "We feel that if similar tests are made later, enough instances of this kind will probably accumulate, so that there will be no room for reasonable doubt that some new process is involved here, which cannot be accounted for or explained in terms of the present known laws of physics. Indeed, we already feel that we have gone some distance toward this point." 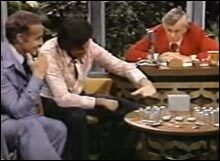 Uri Geller on the Tonight Show in 1973 with Johnny Carson and rent-a-skeptic James Randi, who blocks Geller from using his own equipment. Geller utterly and completely fails all his "psychic" experiments. 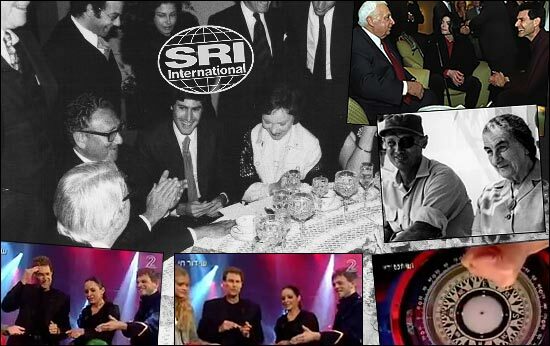 Dr. Wernher von Braun (his protege Dr. Carol Rosin is a fringe anti-SDI and Disclosure Project witness): "Geller has bent my ring in the palm of my hand without ever touching it. Personally, I have no scientific explanation for the phenomena." Col. John Alexander (a master manipulater of the UFO field and a C2C AM guest): "I can attest to the same type of incident, but in a different venue. I was with Uri when he held a session in the US Capitol. With few exceptions, only Congressional members and their staff were there. Uri wanted to talk about how the Soviets were exploiting Jews with psychic ability. This was based on his interviews with many people who had left the Soviet Union and gone to Israel. The group asked him to bend something. While he wanted to address the problem, he did agree and ask for a spoon. One was finally found in a guard's coffee cup. Uri bent the spoon with minimal contact. He then laid it down on a chair about three feet in front of me and went back to talking. As he talked, the spoon continued to bend and fell on the floor. I still have the spoon." Uri Geller has maintained deep and high level Mossad ties since he was recruited at age 13. In his late teens Geller was introduced to and groomed by General Aharon Yariv, head of military intelligence; Meir Amit, head of the Mossad; minister of defense Moshe Dayan; prime minister Golda Meir and the hawkish top politician Ariel Sharon. Even with the tutalage of these individuals, Geller's popularity soon faded for a variety of reasons: He had a limited act and he had walked out of a public television showing after not being able to demonstrate his powers. In the early 1970s, Andrija Puharich brought Geller to Stanford Research Institute for supposed testing at the newly-established Project Stargate remote viewing unit, a Special Access Program controlled by the CIA. This group of scientists and remote viewers at SRI, complete with Uri Geller and even Richard Hoagland, all made it to Coast to Coast AM by the 1990s - and all of them have one thing common: they are total and complete scam artists. March 10, 2014, Red Ice Radio interview with Uri Geller, hour 1: "It all started when I was about 7 years old. ... This amazing story came up from the bible about the twelve spies that Moses dispatced to the land of Canaan. And it fascinated me. ... It ignited something into my mind to become a spy. I loved that idea. I wanted to be a spy. Now, let's go ... 7 years ahead. My parents divorced and my mother took me with her to Cyprus where she married a Hungarian, a Hungarian Jew... He died a year after getting married to my mother from a heart attack. He owned a little hotel, a bed & breakfast establishment with 14 rooms. Now, the Mossad somehow found out that we were running that little hotel. We were both Israelis. ... And they took over this little hotel and they made out of it a safe house for the Mossad, kind of unknown to us. They just engaged the rooms. .. Now, I met an Israeli spy there called Yoav Shacham. Obviously, I was only 12 or 13 years old. I bent a spoon for him. It freaked him out and I read his mind and then I said to him: "Yoav, you are an Israeli spy, aren't you?" And he was astounded. ... [And he said:] "When I'm gone away from this hotel, from your hotel, I will be sending you letters. Letters will be arriving from many different Arabic countries. They'll be letters from Syria, from Egypt, from Jordan, from Iran. And you do not open them. You jump on your bicycle and cycle to the end [audio glitch] of the consul." ... That's how it all started. Yoav instructed me to go back to Israel when I was 18, join the paratroopers, go to officers school, and then find him. ... And I did exactly what he said. ... In the middle of the officers school, I opened the daily paper and I see this huge headline 'Yoav Shacham Was Killed Last Night in a Raid'. And that shattered me. It totally devastated me, because, first of all, I loved the man and then I knew that that was the end of the Mossad dream. But when Andrija went back to America and took me with him and I was kinda thrown into Stanford Research Institute, unknown to me that the CIA was financing all this, then the reality dawned on me. And when these incredible phenomena which started happening... The phenomena happened in many different laboratories, from Stanford Research Institute to the Lawrence Livermoore labs, where they build nuclear weapons. Then it continued at the American Naval Surface Center. These are laboratories that I can talk about. But there were others that I cannot talk about. And the stories of scientists encountering incredible entities in those laboraties, scientists that build nuclear weapons. This is not from Uri Geller anymore. ... This to me validates that period that I was together with Puharich in Tel Aviv. Then one day he says to me: "Look Uri, I want to hypnotize you. I wanna go back and see where this power emanates from and what you're about." And I agreed to be hypnotized. I think I was a good hypnotic subject for him. And he hypnotized me. Now, I cannot remember what happened when he hypnotized me, but he told me that I would tell stories of spacecraft and used the words Spectra and Hoova and I would describe him military situations in Israel. It was quite astounding. You know, there were points where - and I'll be quite frank with you, Henry - that I though the man was fooling me. ... It was real. It happened. ... I have never seen aliens, but I have seen UFOs. ... And I truly believe we were in touch with some kind of higher force, some superior entity that was guiding us and telling us what to do. Let me just continue this pattern of thought. And then he calls Edgar Mitchell [at SRI] ... and Edgar Mitchell sends me signed autographed picture of him walking on the Moon. ... Until this very day I totally believe one hundred percent in everything that happened. I one hundred percent believe in every word that I heard, because he used to play these tapes for me back and forth. I one hundred percent believe that there must be some kind of entity out there that maybe is trying to communicate not only with me but with many other individuals around the world. What's the big deal, Henry, come on. ... I wish they were. I'm in touch with Andrija's son, Andy, who lives in Holland and Andy was gracious enough to give me all the 8mm tapes that Andrija filmed in that apartment in Hirzelya and in our trips in Israel. You can actually see quite a few of them in a documentary called Uri Geller: A Life Stranger Than Fiction ... but the tapes, I don't know where they are. I'm sure they are somewhere, because Andrija would not destroy them. Some of them would just dematerialize in front of our very own eyes. But I'm sure Andrija kept some. Where they are, I don't know. His son doesn't have them. ... The Nine [Ennead] in one of these hypnotic sessions that he put me under. When I was in deep trance, I guess I mentioned The Nine. I had absolutely no idea what that meant. I have [participated in MKULTRA experiments], but I cannot talk about that, because they are linked to certain military aspects, secret agencies, in quite a few continents. But Andrija was onto something really big and doable. Doable - that is the word. And obviously it was military aspects and air force and navy. They all wanted to share the knowledge and use the knowledge. And what you read and what is out there on the internet about Andrija is real, is true, and is probably still being used, but more polished and more technologized. One of the tests, they asked me to materialize a watch, a wrist watch that was in the suitcase. If I'm not mistaken, it belonged to Hal Puthoff. Hal Puthoff was one of the experimentors. And everthing was filmed, constantly by a cameraman... And I tried and tried and it didn't work. And suddenly we heard this clang, this crash, on the experimentation table ... and this watch appears. You know, they wind the film back and they see the watch materializing in mid air, falling, then dematerializes, then it materializes again and falls on the table. And that film disappeared. Where? It is probably lodged somewhere in the safe of the CIA. ..."
January 18, 2015, Uri Geller for The Telegraph, 'My space: Uri Geller': "This ancient sculpture belonged to President Kennedy. I bought it at an auction because the very first book about me, written by Andrija Puharich, was edited partly by Jacqueline Kennedy Onassis, when she was working for Doubleday. I always wanted something that belonged to her and Kennedy." 1001 Club member Sir Val Duncan was a dowser and had met with Uri Geller in the early seventies. He inspired Geller to use his talents to find minerals (Henry Kissinger, Gerald Ford and Alexander Haig were very interested in his talents, according to Uri Geller himself). February 1997, Vol. 2, No. 2a, Jack Sarfatti in MindNet Journal, 'Sarfatti's Illuminati: In the thick of it! ': " Andrija Puharich M.D. worked for Army Intelligence in the early fifties and wrote one of the first studies on psychedelic drugs. Puharich was Geller's case officer in America with money provided by Sir John Whitmore. Ira Einhorn [murderer and Bronfman agent] worked closely with Andrija Puharich as well as with Esalen's Michael Murphy and George Leonard. ... It was the night before the first Birkbeck test of Uri Geller [at SRI in the early 1970s). Brendan [O. Regan of IONS and SRI] was visibly nervous. He asked me to go with him to see the Soviet science fiction film 'Solaris'. Brendan had mentioned that Olaf Stapeldon's science fiction story 'Star Maker', about a time traveling super-intelligence, was based upon real experiences that a high member of British Intelligence  had in the nineteen thirties. The big day arrived. Arthur C. Clarke  was there with a high official from Rolls Royce. Arthur Koestler  was also there along with John Hasted , David Bohm and a few others. These events have been described by Martin Gardner  and I will not discuss them here. What happened after the tests is more important. If I remember correctly, Brendan and I went with Uri to his hotel room where I met Andrija Puharich , Sir John Whitmore and, perhaps, Ira Einhorn . I could be wrong about Einhorn . I startled Uri by asking him if he could trigger a nuclear weapon by psychokinesis. I later found out from Ron Mc Rae  that some of our intelligence people were greatly concerned about that possibility. I may have initiated that concern because I had mentioned it several times to large groups of people at several meetings. ... We flew to New York. Sharon and I spent a few days with Uri Geller, Ira Einhorn, Bob Toben, Sir John Whitmore and Andrija Puharich at Puharich's large house in Ossining. Puharich gave me his book _URI_. I did not have time to read it but I gave it to my mother in Brooklyn a few days later. My mother was reading the book  when she suddenly exclaimed: "Jacky, Jacky, this is what happened to you!" "What happened to me? What are you talking about Ma?" "The computer in the flying saucer that called you on the telephone when you were a little boy. Don't you remember when you got all those phone calls?" An electric shock went through me -- I only remember one phone call. "What do you mean phone calls? I only got one call." "No you didn't! Jacky, what's the matter with you? You got three weeks of these crazy calls. ... I started to spend a lot of time at the [Francis Ford] Coppola's house. I introduced them to Uri Geller and to Einhorn's friend, French UFO scientist Jacques Vallee. ... Carter met Uri Geller on a State Visit to the President of Mexico. Geller fooled Carter like he fooled me, Bohm and Hasted. An intelligence friend of mine told me that Geller was having an affair with the wife of the President of Mexico at the time. I had been contacted by an American intelligence agent for an evaluation of Geller before Carter made the trip as part of the security for the trip. ... "
Red Ice Radio interview with Uri Geller, hour 2: "Well, I don't really, Henry, buy into the conspiracy theorists. If you are alluding to or kind of telling me that, oh, someone else did it - is that what you mean? Or - what do you mean? Tell me in words. What is it, Henry? I'm asking you now a very clear question. What is not right? Tell it to me in words! So what are you concluding here? That who is responsible for that attack? I am not saying that you might be, but what are you telling me? [Host: "I don't know that. I just know that something is very fishy with certain data that we have been given about this story."] Well, that is rubbish! There were terrorists, radicals, who wanted to kill Americans and they flew the planes into the World Trade Center. Full-stop. And that is exactly what happened. And yeah, I do follow sometimes theories of, you know, hunters and conspiracy theories from the Bush [inaudible]. I see it. I see it, but it's nonsense. This is very clear cut, clean, and was understood very, very quickly where they went wrong, certain intelligence agencies, and, believe me, there were certain individuals who were warning of an imminent attack. But there was not enough technology available to - they were listening to other dirty talks, to other noise that was going on at that time on computers and telephones and they missed this focal point of catching these murderers. So that was a big mistake, a tragic thing, and it happened. So my answer is that I don't believe all these stories that some other people are responsible for that attack. [Steers the discussion away:] And again, one of my other missions was a very positive one, to influence the Russians to sign the Nuclear Arms Reduction Treaty. And it was arranged by Senator Claiborne Pell, who was then the head of the Senate Foreign Relations Committee, who sent ambassador Max Kampelman, who actually was a very important and influential figure in Washington - he actually got the president's star, I think by either Clinton or Reagan. And Max flew in to London to brief me." Red Ice Radio interview with Uri Geller, hour 2: "Would you be very kind to repeat what Scott Jones said ... If this is still going on? You remember what Scott Jones said? [remote viewing has gone black] ... And that's my answer to you to the question you just asked me [if it's gone black]."